MAKHTESH GADOL, ISRAEL–Our primary field area on this trip is near Dimona, Israel. Outside the town is a famous facility with domed buildings and a very well guarded fence, complete with cameras and razor wire. My Israeli friends tell me that it is a top secret ice cream research complex. 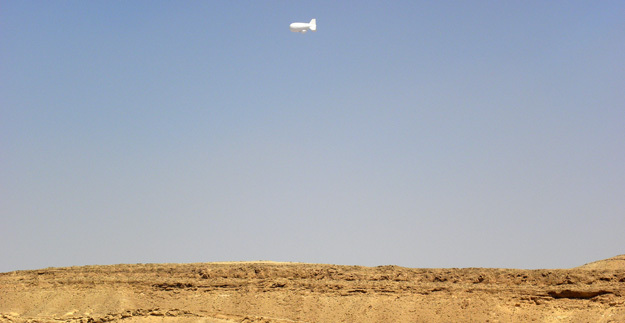 Part of the security for the production of all this “ice cream” is a tethered blimp which rises high above the desert, presumably carrying loads of cameras and other remote sensing devices. Today we saw it being slowly reeled out, first rising as a startling image on the horizon of the makhtesh, and then almost disappearing in the distant sky. We waved hello. MAKHTESH GADOL, ISRAEL–Shade of any kind is rare in the Negev Desert, especially from trees. At lunchtime in the field we want very much to be out of the sun, so usually someone suggests a lonely tree they know along a road or up some path. 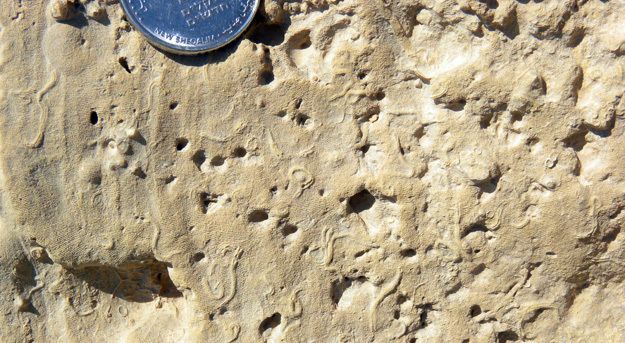 The favorite tree for many Wooster geologists working in Makhtesh Gadol is the acacia pictured below. Sure we’ve had to endure the camel flies and other camel offerings, but that shade has been heavenly. One of the very few trees in Makhtesh Gadol. This is an acacia. 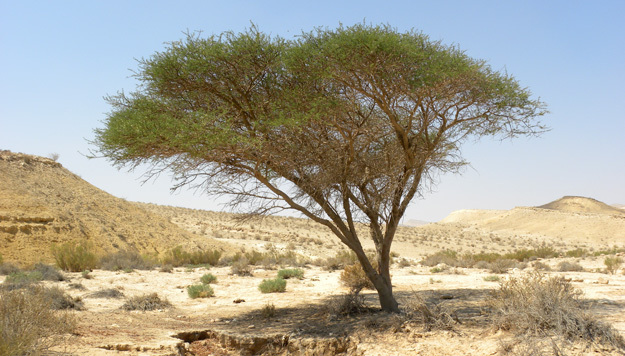 The acacias in the Negev are critical to animal ecosystems as well as in human ecology. They are of a species which originated in Africa and migrated north into the Middle East. They are genetically programmed to produce greenery and flowers during the African monsoons in the summer. As a consequence they are the only green and productive plants in the dry Negev summers, sustaining many animals with their leaves, flowers and beans. The Bedouin Arabs depend on the acacia to feed their livestock during the hot and dry months in Israel and the surrounding countries. Geologists are grateful for the high spreading branches which make a natural desert umbrella. Leaves and flowers of the acacia tree shown above (left); beans and their pods on the ground beneath the tree.